Although domestic sales volume fell, sales of products in the medium to high price range did well, thus keeping net sales flat. Operating profits increased as a result of efforts to further cut costs and expenses. Meanwhile, overseas sales fell and generated less revenue due to the slowdown in the Chinese economy and the effects of local currency weakness. Consequently, net sales for the consolidated fiscal year amounted to 12,853 million yen, a drop of 2.5% compared to the 13,184 million yen in the previous fiscal year. Operating profit amounted to 402 million yen, up 214.7% from 128 million yen in the previous fiscal year. It should be noted that these figures for net sales and operating profit include the results from April to June 2015 posted by the jewelry business that was transferred on June 30, 2015. In the domestic clock field (our main area of business), we are expanding and popularizing the Rhythm-brand products that we reintroduced two years earlier. As part of that effort, we aired television commercials in December of last year and March of this year. We are aggressively rolling out advertisements and promotions geared toward further expanding and popularizing Rhythm-brand products both in Japan and overseas o nward into the future. In addition, as a company with roots in Saitama Prefecture, we con tinue to give our support to the Urawa Red Diamonds(football of Japan national footboll team) in Japan. We are working hard to improve earning power through growth in mid-to high-class products. Overseas, we see our main markets as being in the United States, China and elsewhere in Asia. In the U.S. market we are strengthening our sales infrastructure and finding large-scale retailers through which we can grow our clock business. In China and other Asian markets, we are adding to our list of major online customers and expanding sales of clocks and watches at Rhythm shops. We are also developing fresh products to put on the market such as new clocks to meet customer needs, the TOKIOTO that links with a smartphone, emergency broa dcast radios and new watches. As for production, at our new plant in Vietnam that came online last year we are making progress in building its mass production infrastructure and turning the plant profitable. 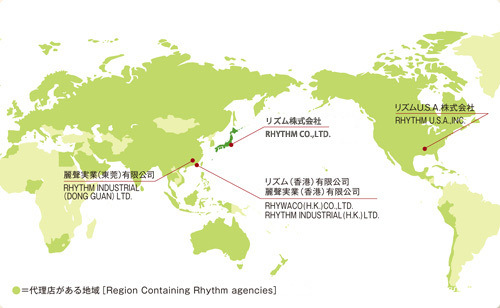 Rhythm Precision Vietnam commenced production of clocks and held a first shipment ceremony on July 27. On December 7 we aired the 15-second "I want one too" TV commercial for the Rhythm Cuckoo Clock, followed in March by the "Warm lifestyle commercial for TOKIOTO, our Bluetooth-equipped LED digital clock.